A wide variety of reference lines and landmarks have been used in imaging studies to diagnose and quantify posterior vaginal wall prolapse without consensus. We sought to determine which is the best system to (1) identify posterior vaginal wall prolapse and its appropriate cutoff values and (2) assess the prolapse size. This was a secondary analysis of sagittal maximal Valsalva dynamic MRI scans from 52 posterior-predominant prolapse cases and 60 comparable controls from ongoing research. All eight existing measurement lines and a new parameter, the exposed vaginal length, were measured. Expert opinions were used to score the prolapse sizes. Simple linear regressions, effect sizes, area under the curve, and classification and regression tree analyses were used to compare these reference systems and determine cutoff values. Linear and ordinal logistic regressions were used to assess the effectiveness of the prolapse size. 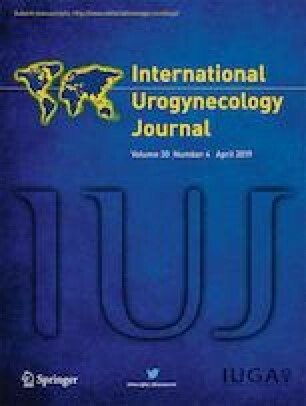 Among existing parameters, “the perineal line-internal pubis,” a reference line from the inside of the pubic symphysis to the front tip of the perineal body (cutoff value 0.9 cm), had the largest effect size (1.61), showed the highest sensitivity and specificity to discriminate prolapse with area under the curve (0.91), and explained the most variation (68%) in prolapse size scores. The exposed vaginal length (cutoff value 2.9) outperformed all the existing lines, with the largest effect size (2.09), area under the curve (0.95), and R-squared value (0.77). The exposed vaginal length performs slightly better than the best of the existing systems, for both diagnosing and quantifying posterior prolapse size. Performance characteristics and evidence-based cutoffs might be useful in clinical practice. This research was supported by the National Institute of Child Health and Human Development SCOR Grant #P50 HD044406. The NIH did not play a role in the study design; in the collection, analysis and interpretation of data; in the writing of the report; or in the decision to submit the article for publication.